This month we held our first Story Time sessions in the new store and what a response there was! It has been a delight to see lots of little faces turning up each week for a story and some activities, especially some of the little faces who have come back because they love it so much! When choosing a book for Story Time each week I always try to pick a story that will engage and delight toddlers, preschoolers and even school aged children alike. Room On the Broom was a no-brainer for me! This book grabs children’s attention straight out of the gate with it’s promise of a magical journey and characters such as the kind natured witch who is always losing something while flying through the air on her broomstick. With the help of some new animal friends she manages to retrieve all of her lost belongings and in return she offers each of the animals some room on her broom. But what happens when there are just too many on the broom?? It breaks of course!! This leads to an encounter with a hungry Dragon and what happens to ensure the witch’s escape is something that will have kids giggling. Written in rhyme and a rhythm, as well as great use of repetition, Room on the Broom is easily picked up by young children. This means after reading the book just once or twice, even 2 year olds will enjoy joining in to ‘read’ the story. I love the way that the witch taps her stick each time before taking off – this is a great device for encouraging listener participation (children can “tap” their stick as you read the words and make the sound of “whoosh” as the witch takes flight). With the introduction of so many fabulous characters there is also the perfect opportunity to use interesting and fun voices. During our Story Time session we also added some puppets and gave the children a pack to make their own at home. Adding the puppets is another way to expand on the illustrations and get kids involved. To make some of your own puppets use this free printable – just cut out the awesome characters from the book and attach a paddle pop stick, Voila! 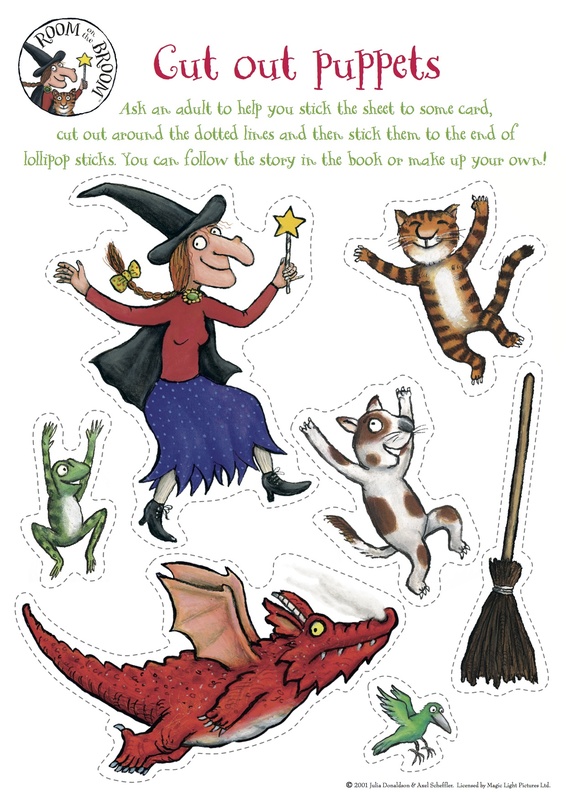 You can also head over to the Room on the Broom website for this free printable finger puppet sheet. Room on the Broom is a gorgeously illustrated, fun book that speaks of friendship, generosity, and working together through adversity. If you haven’t read this book with your child I’d highly recommend popping in and picking up a copy!